KATHMANDU, July 4: Experts have attributed CPN-UML's nationalist stand during and after the Indian economic blockade, the weak leadership of rival parties and a strong organizational base for its victories in the local elections. They also cite high morale among the party's cadres as another important factor behind UML's good showing at the polls. 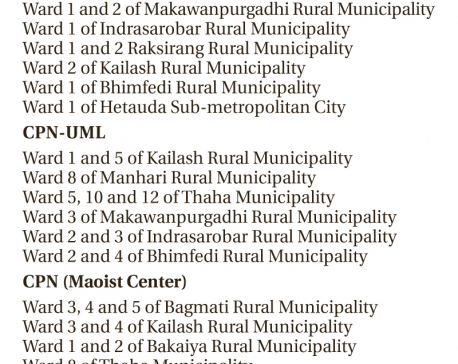 As the vote count continues for the fourth consecutive day Monday, UML has won the posts of chiefs of 114 local units while NC has been limited to 98, as of evening. Likewise CPN (Maoist Center) has won the posts of chiefs of 30 local units. UML also maintains a lead in 25 units followed by NC in 24 and Maoist Center in 6. Political analyst Bishnu Sapkota hails the UML leadership's stance during the Indian blockade after the promulgation of the new constitution as the major factor behind UML's victories. He also cites supporting factors. “A major credit for UML's victory goes to its position during the Indian blockade and its stance later on other big political issues,” said Sapkota. UML's decision to impeach Lokman Singh Karki and oppose the impeachment against Sushila Karki also garnered sympathy from the public and swayed neutral voters ahead of the local polls. Then prime minister K P Oli made a robust stand against India during its five-month economic blockade against Nepal. UML also took the leadership in registering an impeachment motion against Commission for Investigation of Abuse of Authority (CIAA) chief Lokman Singh Karki at a time when Karki was incurring huge public displeasure. “UML has also benefited from the uninspiring leadership of the ruling NC after [Sher Bahadur] Deuba took over the helm of the party,” said Sapkota. NC leader and lawmaker Shekher Koirala accepts weak leadership as one of the major factors behind NC's weak performance in the local elections. “Groupism remained a dominant thing in NC while finalizing candidates for the local units and this resulted in non-cooperation during the election. Also, the nationalistic stance of the UML seems to have helped the party,” he told Republica. According to Koirala, UML and other political parties benefitted from internal rifts within NC. The party leadership failed to even manage the party general convention in March 2016, he pointed out. UML deputy-general secretary Ghanashyam Bhusal hails the party's position on public issues, its nationalism and its orderliness and intact organization as major factors influencing the voters in its favor. “The general public saw the UML as being clear and determined in its position when our leadership refused to bow down during the blockade,” said Bhusal. Some indigenous leaders of the party quit UML before the second Constituent Assembly (CA) elections, alleging that the party was anti-ethnic and anti-indigenous indentify. But most of thom lost the elections and UML emerging as the second largest political party from a distant third in the past. This also might have left a good impression on the public,” said Bhusal. According to him, candidate selection in the party was free of dispute, compared to during the previous elections, and this was due to a strong and intact party leadership. 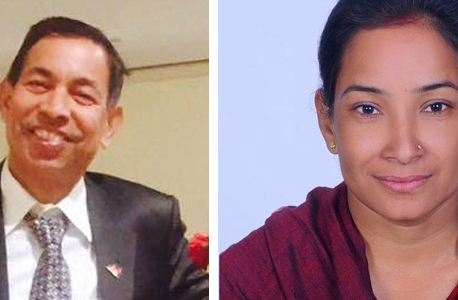 UML leader Bhusal and analyst Sapkota both agree that good organization and morale among cadres are also important factors in the party's performance in rural areas.